What are the 5 Essential Ways that Big Data is Going to Impact All Industry Channels? Every industry not just the IT sector has standard and imbibed practices that define and guide its creative process. And when it comes to the IT sector, especially android app and software developer’s basic and primary practices are vital to give guidelines and define success. Android developers are prone to limitations but also have liberal approach in developing software. Yet with strict adherence to technical aspects of android app and software development protocols, these aspects make an important impression on the developer’s successful ability to create new defining android apps and software. 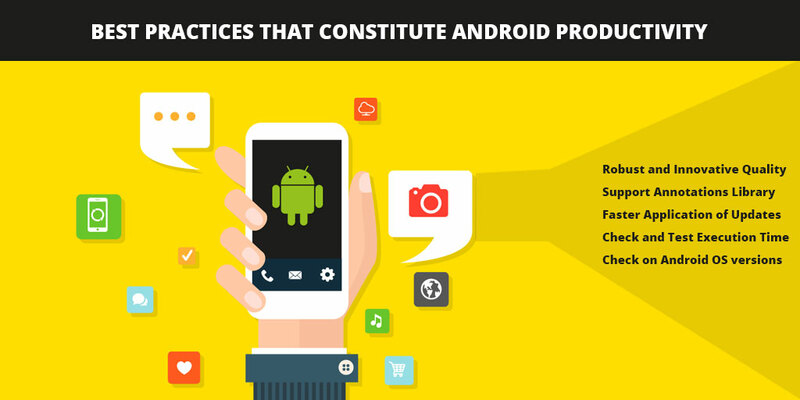 Whereas there may be so many variations in what makes the best practices for Android, these few may underline and state the basic considerations for best practices in Android productivity. Robust and Innovative Quality: one of the most effective needs and important assessments is the need to maintain high level of quality at stages and levels of development. Productivity and efficiency of software engineers work relies on deep knowledge, expertise, toolsets and environment configuration as well as team work. Support Annotations Library: metadata annotations to decorate code help catch bugs and define code rules. The most common use cases for them are marking nullable and non-nullable, identifying integer as resource, and specifying from which thread they should be called. Since annotations are metadata, projects compile them even though defined rules are violated. Though this is shown by Android Studio and is easily visible to other team members. Immediate Standard Android Code Review: if there is any need of doing a code review it makes sense to check how the developed feature works, so project compilation is inevitable. The solution lies in the Checkout branch to review. The best path is the use of dedicated IDE instance and repository folder for effective code review as work cannot halt for a while and it is possible to return to main IDE and branch at any time. Faster Application of Updates: even with small Android projects, it is always vital to spend some time waiting for the building and deployment of latest updates to the test device or emulator. Should there be several instances of hundreds of classes and xml layouts, each rebuild and re-deploy may significantly cost a lot of time — even on faster and more powerful machines. Moreover, it requires manual navigation to the application screen where the updates things are and this also requires some effort. Check and Test Execution Time: another extremely useful feature during application debug and performance analysis is logging method input/output and execution time using simple and elegant annotation tool. It works fine in reading the log but it is also vital for daily application in reading logs Android Monitor inside Android Studio is applied. Check on Android OS versions: test every feature in developer test on OS system versions like; Lollipop or on higher and pre-Lollipop devices or emulators. Common types of bugs discovered this way are touch feedback and system colors issues. Though there are more considerations, these are some of the best and fundamental practices in Android productivity that point out the best way to work on Android app development.